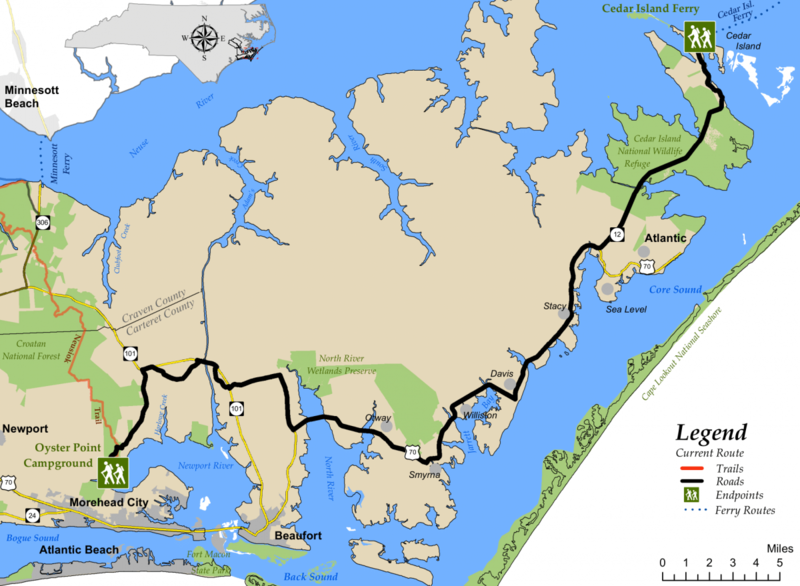 This 48-mile segment of the MST takes hikers “Down East” to see the North River, small fishing towns that face the Core Sound, and the 14,500 acres of the Cedar Island National Wildlife Refuge. Heading east from Oyster Point Campground, the southern terminus of the Neusiok Trail (part of MST Segment 16), hikers experience a short roadside glimpse of the beauty and variety of the Croatan National Forest before crossing the North River to enter a part of Carteret County that its residents have traditionally referred to as “Down East.” Fishing, particularly for shrimp and blue crabs, is a mainstay of the economy. Along US 70 at Eastbound (EB) Mile 20.7, Westbound (WB) Mile 27.2, look for the entrance to the NC Coastal Federation’s North River Wetlands Preserve. 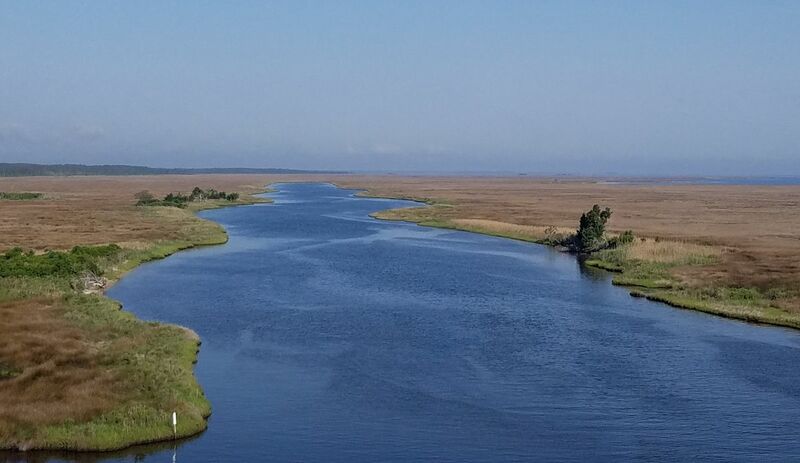 NCCF is restoring this 6,000-acre farm back to its original state—forested, freshwater and tidal wetlands—in order to improve the water quality of degraded downstream estuaries and reopen these waters for shellfishing. In the future, when a bridge and boardwalk is built near the headwaters of the North River, the MST will traverse this property for more than eight miles. Hikers can visit the preserve now by registering and paying a $5.00 fee at the entrance. The trail route continues through a string of Down East communities fronting Core Sound. 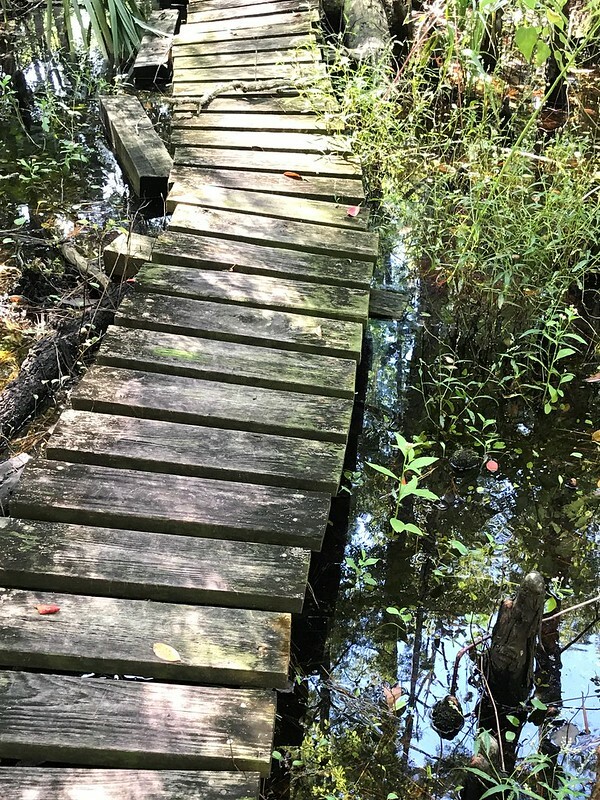 Hikers are rarely out of sight of bays, estuaries, and wetlands as they walk through Otway, Smyrna, Williston, Davis, and Stacy. The route veers off US 70 onto NC 12 as it nears the Cedar Island National Wildlife Refuge, where the only people on the road are visiting the refuge or heading for the ferry. The refuge sits where the Pamlico and Neuse Rivers empty into the Pamlico Sound. Here vast marshlands stretch toward the horizon, dotted with occasional “islands” of trees. Two hundred and seventy species of birds, 91 of amphibians and reptiles, and 35 mammals are known to live in the refuge, including breeding black rails, a bird species of special concern.